A new lab based at the University of Idaho is setting out to improve K-12 teaching and learning with technology throughout the state. Yet the use of technology may be the smallest element of all in its training toolbox. The Doceo Center for Innovation + Learning (pronounced "doe-chay-oh" for the Latin word for "I teach") opened in June 2013 and cut the ribbon on its new technology lab this April. Since then 1,856 participants, including teachers and university faculty, have received professional development in improving learning through technology integration. Funded by a grant from the J.A. and Kathryn Albertson Foundation, the amply outfitted center is intended to act as a "hub" for connecting research, teaching and K-12 outreach. In the process, Doceo is demonstrating that excellent professional development is less about how to use technology and more to do with valuing teachers and helping them achieve their classroom vision. This summer the center is hosting four "institutes" — each with 30 teachers from grades K-6 or 7-12 — in three-day professional development sessions that give the educators a chance to experience the technology up close. Yet these sessions are not "about the technology," insisted Director Royce Kimmons. He said he prefers to describe them as opportunities for participants to have the time to "flexibly think about teaching and learning." When the teachers arrive, they're divvied by subject into professional learning communities (PLCs) — teams of five or six. The first day is filled with what Kimmons called "traditional instruction." The teams also set goals for what they're going to do on the second day — what "product" they're going to create. Since these particular institutes focus on open educational resources (OER), the product might be a unit plan, a chapter of a textbook, an anthology or something else. From that point on, each PLC is left on its own to collaborate and create. Kimmons roams the room to provide help and facilitation. "That's something they're not used to," he observed. First, "They're not used to being treated as professionals in that way, being treated like experts in their content areas." Second, they're also not used to sitting at a table with others and being able to share their work in a collaborative experience. "A lot of them come from schools where they might be the only teacher in their subject area, or even if they have other teachers in their subject area, they're not given time to collaborate," he added. "That's actually the biggest theme that I've taken away from these so far. Our teachers are so strapped for time. They want to innovate; they want to try new things; they just don't have time to do it." Idaho schools — like schools in most other states — have a mixed bag of technology. Some teachers are involved in iPad or Chromebook programs; others don't even have laptops. Yet the lab is intended to help all of them, no matter what the state of technology is in their individual districts. For that reason, the purpose of the center isn't to teach technical skills (though help is available). "We're about teaching technical literacy," Kimmons said. The idea is to provide a space for educators "to explore and generate a vision for what they want to do in their schools." Ultimately, he added, "it comes down to how they're using technology, not what technologies they're using." For example, even though the teachers are learning about OER in the latest institutes, if they don't have access to devices in the classroom, the center will help them by printing off the class materials via print-on-demand services. Students don't need their own computers to use those. That philosophical approach seems to work for the teachers who attend sessions at Doceo. "We ask them straight out, 'Was this a valuable use of your time?' Teachers are [blunt]. They'll tell you," said Kimmons. "So far, every single person who has participated has said, 'Yes, it's a valuable use of my time.'" In fact, he noted, a third — including those with decades of experience in the classroom — have proclaimed it "the best professional development experience they've ever had." Kimmons said he wants to avoid the impression that technology is a "silver bullet," that if every student is provided with a device, "if we roll out this or that initiative, they're going to magically learn." There is no "bump," he pointed out, "from introducing technology." But while technology itself isn't a change agent for improving teaching and learning, "What is a change agent in the lives of our students are the teachers. Our goal is to work with the teachers to really improve that." The initial design of the lab focused on collaboration, said Kimmons. However, the space will evolve in time to encompass much more. 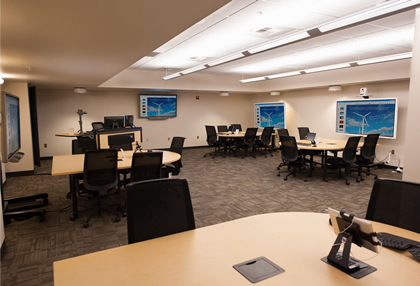 The university commissioned audio-video integrator CompView to design the room. The lab has five "collaboration centers" that seat up to six people. Each station has a 55- or 60-inch touch display and a dedicated iPad at the table for controlling that display. Participants sit at the tables and plug in their own computers or grab an iPad or Chromebook from the carts at the back of the room and plug those in to display what's on their screens. Or they can use the Apple TV at the station to share screens or presentations from iPads or iPhones. One workstation has a pan/tilt/zoom camera to record interactions and to enable remote participation via Skype or another application. The Doceo lab features five collaboration centers with touch displays and iPads. The instructor station includes a 60-inch touch display, as well as a computer with a 22-inch touchscreen, a Blu-ray player, a document camera and a touchpanel managed through an iPad that can control one screen or all of them. Yoga balls on stands, which are becoming popular in classrooms to help students bounce and balance but also focus better. When they're tired of sitting, teachers in the lab can just grab a ball for seating and shove their chairs out of the way. "I see us building onto that as time goes on," Kimmons said. "We are very interested in flexibility." Some of that flexibility was injected into the project by necessity. The building originally designated to host Doceo is being torn down and replaced. In the meantime, the center took over a temporary home in the student union building, which isn't "ideal." For example, a "big pillar" sits in the center of the room, and the space is a "little cramped." So the existing lab was designed to be picked up and moved when its new home is eventually built. Also, the room is designed to serve as a "skunkworks" for the university. "We can try something out and evolve the lab to see how something works," Kimmons said. "A year from now I could see us taking many or all of the collaboration stations, transitioning those into a classroom, and then trying out something new in the lab. It's a space where we're constantly evolving, constantly innovating and trying new things." Although plenty of teachers have already taken advantage of professional development offerings at the lab, the center has made a point of getting to schools as well. Technology Integration Specialist Cassidy Hall travels to schools, interviews administration and staff, develops a needs assessment and comes up with an individualized training plan "based on the needs and goals of that school," Kimmons explained. Popular topics for training currently include the use of specific computing devices in the classroom, the use of Google Apps for Education and working with interactive whiteboards or document cameras. Doceo is also collaborating with the Northwest Inland Writing Project to help teachers integrate technology into the student writing process. But getting into districts to do that work wasn't a gimme. The center staff spent a long time building relationships with the state's schools. "K-12 schools are a little hesitant to work with higher education institutions and anyone they perceive as top-down. They're often distrustful of outside organizations," said Kimmons. On top of that, he added, school leaders are "bombarded with lots of things, and they never know what's legitimate and what's worth their time." Before and after every session with teachers, the center surveys them: Was the training a good use of their time? Was it practical? Did it help them think critically about how to incorporate technology into the classroom? The responses Doceo receives are "overwhelmingly" positive. "They are completely bought in," Kimmons declared. "They completely believe that what we're doing is valuable for them." The results of those evaluations are shared in a public "impact dashboard," which also maintains a count of the number of schools and participants, new grant dollars awarded as Doceo works with schools and other program details. A natural next step, Kimmons added, is to examine student outcomes. But he's not sure when or even if that will ever happen. "We would love it if we could go to a school, roll out an initiative there and see a 10-point bump in standardized test scores. Looking at the literature, that tends not to be the case," he acknowledged. So for now, Doceo will settle for that teacher feedback. "What I am hoping to see is that over time we help to develop these teachers and give them the support they need to be more competent professionals than they already are. The indicator I'll take is their perception of what is working in the classroom — what helps them to do their job well."